Believing in yourself is one of those things that is completely in your control yet seems to allude many of us our entire lives. Why? Because there is not a step-by-step formula for success. There is not a one-size fits all answer each of us can follow and be guaranteed confidence and self-esteem. And yet, the key to believing in our selves lies within each of us. Accessible in every moment of every day. Our thoughts about our self are the main force behind our beliefs. Are you aware of what are you saying to yourself day after day? In each moment? Are you aware of the conversations going on in your head? Are there other people talking to you (in your head) – such as your parents, your boss or partner? Are you repeating the same negative statements to other people over and over again? Taking control of the conversations with yourself is the first step to believing in yourself. Believing in yourself is an art because the journey to knowing you will achieve a goal or successfully accomplish a difficult task is different for each of us. And it requires you to be creative. To look at yourself and your beliefs differently. Imagine your thoughts, that incessant internal conversation going on in your mind, as a big ball of string all tangled up. 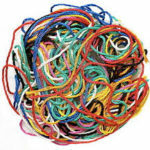 Each string is a statement or conversation thread. Your job is to first recognize a string, pull it out and separate it from all the others. And then determine if it is your string or not. Is this statement true? Is this me talking or someone else? Do I choose this string for me today? This string may have served you when you were young, but no longer does today. YOUR strings are the truth about yourself. They are loving, kind, supportive statements and beliefs. They are your true Spiritual self, which is never unkind or unloving. Other people’s strings are knotted up in your ball. And there are strings that you have taken as yours but do not speak and know your truth. Your job is to evaluate each string and make a conscious decision to keep it or not. In order for you to believe in yourself you need to not only master your thoughts, but ensure your beliefs support you and aren’t tearing you down at every turn. Fresh Tracker John Allcock shares on the Fresh Tracks podcast that “awareness gives us the power to realize we are choosing to listen to negative thoughts and the choice to choose positive thoughts”. The art of believing in yourself requires some introspection, examination, and trust. Curating the awareness of your thoughts, your beliefs, your intentions is how you begin to believe in yourself. This entry was posted in Law of Thinking, Mindset and tagged Beliefs, self esteem, Universal law on December 5, 2018 by admin. Olympian Ester Ledecka knows firsthand the rewards of cutting Fresh Tracks, creating an astounding upset in winter sports history by doing her own thing her own way. Winter sports enthusiasts know – skiers aren’t good at snowboarding. And snowboarders can’t ski if their life depended on it. The two sports are completely different. Both the mechanics of the sports and the culture of each are night and day. In fact, the ski industry is known for snubbing snowboarders and consider snowboarding more of a “performance” than a true sport. Along comes Czech Ester Ledecka – who didn’t give a hoot about athletic norms as she became not only the first woman to compete in two sports in any winter Olympics, but she also won two gold medals; one in women’s super-G Alpine skiing and the parallel giant slalom in snowboarding. This was a complete upset in the Alpine ski world. Why? Let’s take a look…. When Ester raced the super-G she was the 26th skier to come down the mountain – that’s how far behind she was in the ranking. The race had already been called – photos of the medalists had already been taken! Ester first skied at age two and tried snowboarding at age five (because her brother was doing it). As she grew she trained in both sports and actually had separate coaching staffs and schedules in order to develop both skillsets. Ester refused to listen to advice to specialize in one sport – which she had been told to do since she was eight. When asked what she would do if she were pressured to choose one sport she replied she would choose a different coach instead. Ledecka is a snowboarder by trade and has only competed in skiing for two years. She had never placed higher than 29th and came into the Olympics ranked 43rd in the world cup standings. Ester was happy to be the first person to ever compete in both sports at the Winter Olympics as that was her goal. She started the winning race in the 26th spot, beating the first-place winner by .01 seconds. Ester is dedicated, disciplined and focused – which is why the Law of Success is the Universal Principle that led to her ultimate gold medal. The main worry her coaches have is that she never wants to get off the slope, which in Alpine skiing can be dangerous. “She is absolutely focused,” says her skiing coach Thomas Bank. Her coaches say that because Ester both skied and boarded she was able to see the mountain differently when Alpine skiing. She was able to act more like an artist and create her own path rather than focusing on technique and best practices others have mastered. Where are you “staying in the lines”. Where are you doing what’s expected of you rather than what you desire? Do you have the support system in place to support your decision? Are you expecting to succeed? In herself. Didn’t listen to or follow advice from experts to specialize in one sport. Law of Success – Every one of us is designed to succeed because the Universe is conspiring in your favor. Always. 1st woman to compete in two Winter Olympic Sports. Two gold medals. This entry was posted in Law of Success, Law of Thinking, Mindset, Personal Power and tagged Coaching, Ester Ledecka on March 14, 2018 by admin.